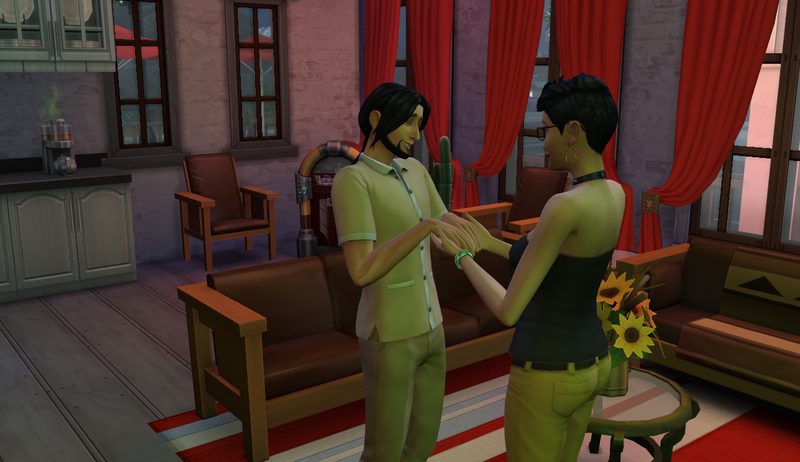 Michiru goes to a bar, meets a guy, and asks him to move in (wow). Michiru came home from school early and aged into a young adult without a cake. Darn! She celebrated by having lunch with Maggie. She should perk up soon. The sparkling food can really ruin a shot, gotta say… I think I’ve seen a mod for that? I wanted Michiru to trim down a little but also raise her fun level so I moved the treadmill inside by the tv. There’s enough room. 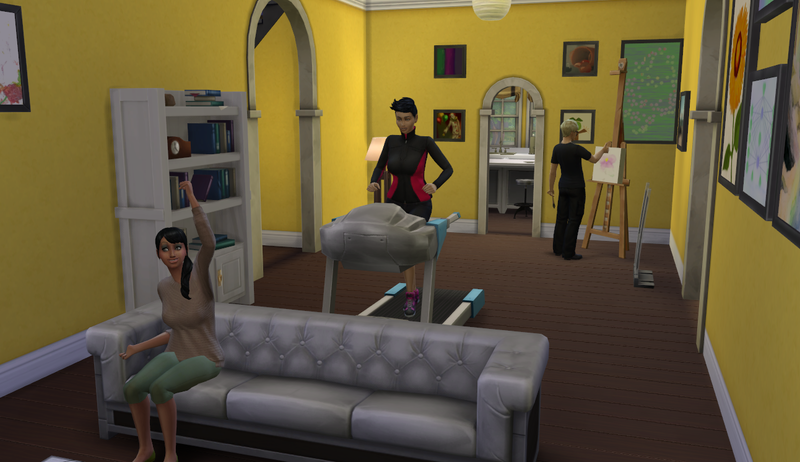 It’s a little tacky but I don’t feel like making a gym room right now. Maybe once the money starts coming in again then we can add on a new space for that. Elisabeth is so cute! Look how excited she is for whatever is on tv! 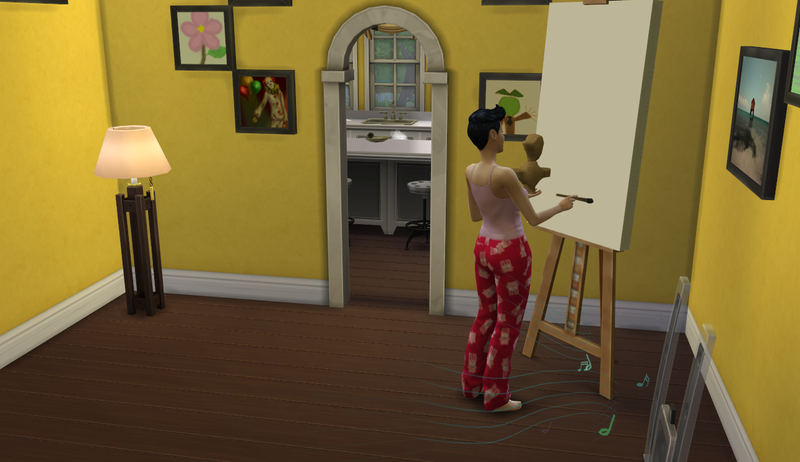 I had Michiru join the painter career and she started on level 3 because of her excellent grades. Look how artistic she is with her clay and her paintbrush. Multitasker, I tell ya. 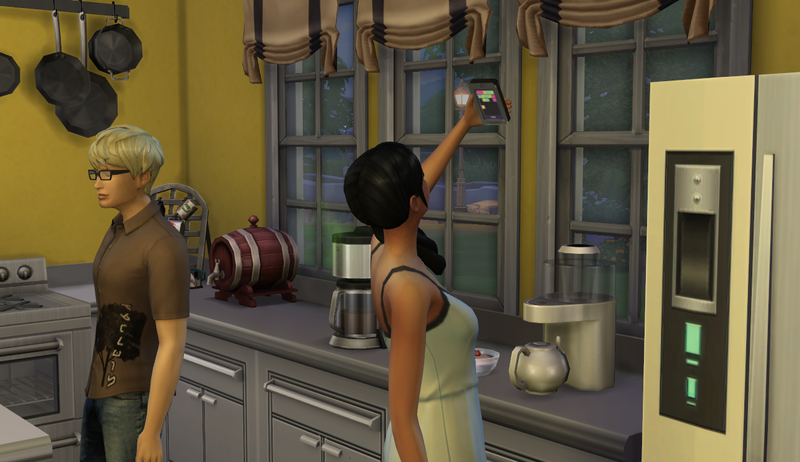 Back in the kitchen, I caught Elisabeth in the act of a selfie and wanted to see what their phones look like, and… BlicBlock? Weird. Yuki and Toya aged into young adults without a cake YET AGAIN. I think I’ve missed every single one of their birthdays. Oops. They both managed to get A’s before leaving school. I was nervous for Toya but he got it just a couple days before. Phew. 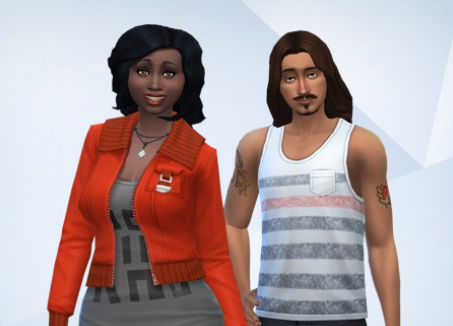 Yuki got a job as an astronaut and Toya as a writer. Or is it the other way around? I’ve since moved them out so I guess I won’t check. Oops. I think Yuki became an astronaut because he was active. That makes sense. Back to Michiru. This chapter is called “Michiru’s Love” so you’d expect to see a bit of that, yeah? Okay, fine! Looking rather trim, Michiru went to the bar to mingle. 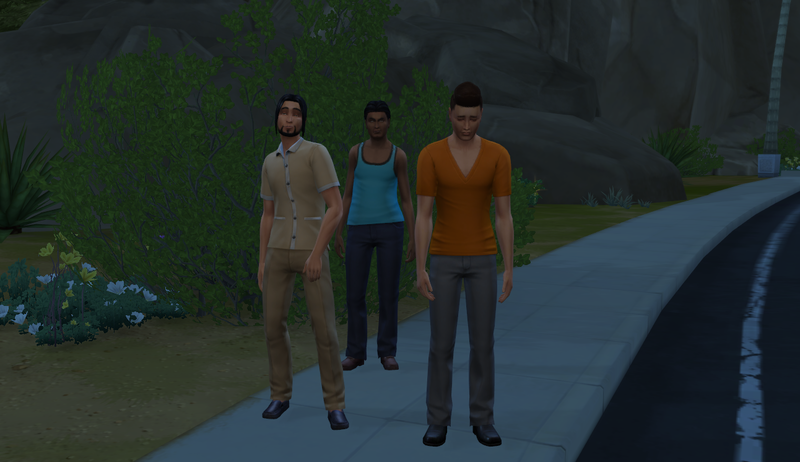 Here is the problem I’m having with the legacy: relatives. Two out of three guys in this shot are related to her. If I wasn’t paying attention I wouldn’t know. INBREEDING. NOPE. I took a long look around to see if there was anyone else on the lot. I didn’t feel like dealing with loading screens (I’m lazy, what can I say?) She started talking to the skinny guy, Adriel Adams. My hopes dropped when she learned his first trait: evil. Ugh. Not again. Still, I decided he wasn’t bad looking and his nose was really interesting so I thought, sure, let’s go with it. They got on really well. …aaand I took a different route than usual and had him move in. Michiru didn’t seem like the traditional girl so I didn’t have them get engaged. I’m not sure how Maggie feels about this but I didn’t ask. I don’t think she minds. Oooooh I love Adriel’s name, and his nose. I hope one of their kids gets that nose. I ❤ Adriel!!!! His nose was amaaazing!! !